As far as commitment phobias go, the fear of committing to a technology is a pretty rational one. Moore’s Law pretty well guarantees that, no matter how carefully you buy something technological, its value will have diminished – it will have less grunt than it might have, millions upon millions fewer transistors than it could and should have – even before you get it to the cash register. By the time it’s been paid for, wrapped up and you’ve walked out the door, forget it. It’s obsolete. You may as well turn right back round and get the next model. eGPUs are best used with an external monitor, as a docking station on steroids. This may be why God invented eGPUs. External Graphics Processing Units, simply known as eGPUs, are devices you attach to the notebook (or in some cases the all-in-one desktop PC) that was already out-of-date when you bought it, to make it very much less out of date. Being a piece of technology, it goes without saying that the eGPU will itself be out of date by the time you get it out of the shop, too. There is only so much you can do to swim against the tide here. eGPUs increase the power and longevity of your notebook computer by supplementing the very tiny, relatively underpowered, portable-grade graphics chip in the notebook computer with a full-blown, desktop-grade graphics chip, instantly giving you vastly more processing power for applications such as games, video editing, BitCoin mining . . . anything that uses the graphics chip on your laptop, as opposed to using the main processor (known as the CPU, or Central Processing Unit), which in the absence of an eCPU will remain forever out of date. It’s not just notebooks that can benefit from an eGPU. Here we have an iMac that seems to be using one. Indeed, eGPUs are so much better at graphics than the GPU in ordinary notebooks they can even be used to jazz up the most modern, least-out-of-date notebooks on the market. 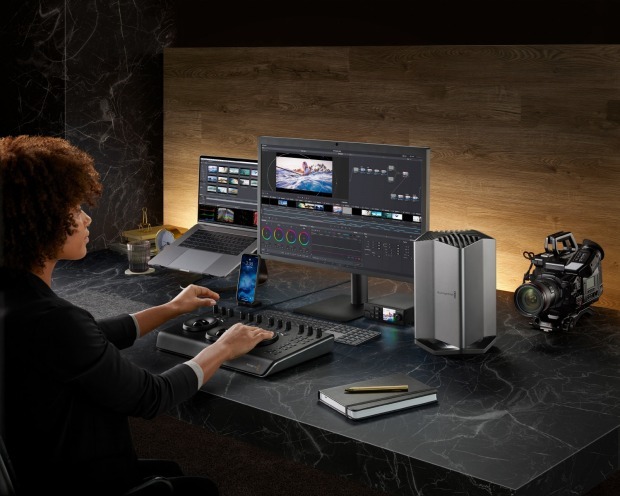 We know this because that’s how we’ve been using the new BlackMagic eGPU this past week here in the Digital Life Labs: attached to the very latest Apple MacBook Pro, which already has a very powerful Intel Core i9 CPU and a relatively powerful AMD Radeon Pro 560X GPU on board. 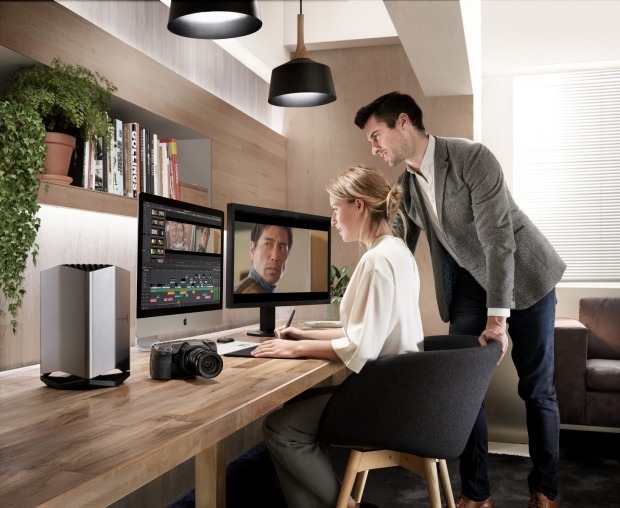 The BlackMagic eGPU, which connects to the MacBook Pro via a Thunderbolt 3 cable (more on that in a moment), comes with an AMD Radeon Pro 580 GPU built into it, and when you run graphics-intensive apps on the MacBook and get them to use the BlackMagic’s GPU rather than the internal GPU, the performance difference is startling. Depressingly so, in fact, given it demonstrates just how underpowered the GPU in our brand-new, $7139 MacBook Pro is, relative to a $1149 external GPU. Running the Unigine Valley benchmark test on the MacBook Pro, for instance, the GPU on the MacBook Pro was able to render an average of 18.8 frames per second, but the eGPU was able to render almost double that: 36.1 frames per second. Similarly, the Unigine Heaven benchmark test rendered an average of 17.2 frames per second on the MacBook’s own graphics chip, and 36.3 frames per second on the BlackMagic. That’s more than twice the speed. Mind you, that’s with the BlackMagic sitting between the MacBook Pro and an external monitor, which is how it’s designed to be used. It comes with four USB ports on the back, meaning you should think of it as a notebook docking station on steroids. If for some reason you tried to use the eGPU to drive the MacBook’s own screen, the results will often be unimpressive. The Unigine Valley benchmark renders at only 18.1 frames per second in this configuration, for instance, worse than having no eGPU at all. Now, the Intel Core i9 processor in the MacBook Pro does itself have a small GPU built into it, known as the UHD Graphics 630 GPU. It’s designed primarily for notebooks that don’t have a discrete GPU on board, and hence is not put to much use on the MacBook Pro, which as I said comes with a Radeon Pro 560X GPU. But we benchmarked Intel GPU that, too, to give you an idea of how much speed you could add to a notebook that’s not really designed for a heavy graphics workload the way the MacBook Pro is. And the answer is . . . a lot! In the GeekBench 4 graphics test, the BlackMagic eGPU scored almost exactly five times higher than the UHD Graphics 630 GPU: scores of 112,367 versus 22,152. And, remember, this is the very latest notebook I’m comparing the BlackMagic with. Imagine how it might outscore that outmoded piece of junk you bought the week before last! And the thing is, the BlackMagic eGPU isn’t even the fastest eGPU you can buy. It’s designed to add a lot of grunt to even the fastest notebook, yes, but it’s also designed to be used in a working environment (such as a video editing suite) where noise levels have to be kept low. The BlackMagic eGPU is almost completely silent most of the time, and only becomes slightly audible when you place it under a heavy workload. It achieves its quietude both by running a GPU that’s not the most powerful on the market (the NVIDIA GeForce GTX 1080 Ti is roughly twice as powerful as the Radeon Pro 580, for instance), and by having an enclosure and cooling system that’s custom designed to hold the Radeon. Which also means that, unfortunately, the BlackMagic eGPU can’t itself be upgraded. Once the Radeon Pro 580 it houses runs out of steam, you’ll have to replace the whole eGPU, card and chassis. Other eGPUs, such as the Razer Core X, let you replace the GPU inside them, meaning your notebook’s upgrade can itself be upgraded, further extending the life of your old notebook. There’s one more reason why this particular model may not be the eGPU your old laptop has been waiting for: it connects to the laptop via a ThunderBolt 3 connector, which older notebooks typically don’t have. But, fear not, there are plenty of eGPU options out there for older notebooks, too. Some of them rely on those old Expresscard slots you used to see on a lot of machines. Some of them use older ThunderBolt 1 or ThunderBolt 2 connectors. Some of them, you have to open up your old laptop, rip out the WiFi card and replace it with a card that attaches to the eGPU. And you know what opening up your old laptop means, don’t you? One accidental-on-purpose slip with the screwdriver, and the laptop will be ruined. You’ll have to buy a shiny new one. Which is probably what you wanted all along, right?